The permanent exhibition, opened at the end of 2004, is located in the original barracks, RI and RII, which were restored under the direction of the architect Dr. Günter Hipfel. The buildings were constructed in 1936 and the way that the Frey Aichele Team Firm (Berlin) designed the exhibition underscores their authenticity: The ceilings and walls were kept completely free of any installations or exhibitions pieces, free standing, large glass display cases filled with exhibits as well as numerous media stations emerge from the glass bridges which lead from one room to another. The tour begins in RII and then leads through the underground passage between the two barracks and through the cellar which then leads back to Barrack RI. The cellar rooms were left in their original state, but with information supplied regarding their earlier uses. “Medical Care and Crime” is the largest exhibition at the Sachsenhausen Memorial Site with about 800 sqm of space and around 1,000 exhibit pieces. One of the focuses is the “everyday” medical care in the concentration camp. Depending on what the SS wanted to do, the infirmary was accorded certain functions which changed over time. Initially the infirmary was supposed to provide basic medical care to the prisoners, something which was also advised for propaganda purposes. Then after the war began, disease prevention moved to the forefront since contagious illnesses were spreading throughout the camp due to the worsening living conditions; illnesses which also endangered the SS. From 1942 on, the main function was to make the sick prisoners healthy enough so that they would be able to work, since they were supposed to be exploited for the German wartime economy. The selection and murder of sick prisoners who the SS deemed would no longer be able to get well enough to work is necessarily connected to this function. In addition, the infirmary began to serve as a kind of sick bay jail for the Gestapo special commission, “July 20th”, beginning in summer 1944. Moreover, some of the sections were used as display areas, and functioned as exhibition objects for the visitor tours which took place several times per week in the camp. In the second main part of the exhibition, the medical crimes which began in the Sachsenhausen Concentration Camp are the main subject. Alongside the eugenically motivated forced sterilisation and forced castration of the prisoners who were classified as “homosexual”, this exhibit is above all about the mass murder of sick prisoners “14 f 13”. Another focus concerns the anthropometric research conducted on Sinti and Roma at the “Berlin Eugenic Research Centre”. This “race research” is put into the context of the entire history of the persecution of this minority, in order to bring attention to the central role of the scientist in the systematic mass murder of Sinti and Roma. 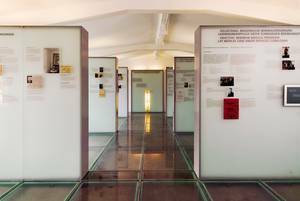 Finally, the exhibition addresses the subject of human experiments, illuminated by the use of four examples taken out of a vast number of the experiments which were conducted in the Sachsenhausen Concentration Camp. One of the examples can even be presented at the actual location where the events took place, in room 51 of barrack RII, where children and young men had to live through over a year of continuous experiments. This particular example is the story of eleven young Jews who were brought directly from the Auschwitz train station platform to the Sachsenhausen Concentration Camp’s infirmary in the Summer of 1943 for hepatitis experiments. There is a “Learning Centre” at the end of the exhibition with eight computer work stations where the visitor can make use of an interactive, multi-media presentation on the subject. The application is available in both German and English and includes around 1,300 screen pages. There are ten “speaking objects” in the Centre which the user can use in order to tap into important aspects of the exhibition. A lexicon provides over 500 articles on historical topics, medical terminology, perpetrators and victims as well as background information about the preconditions, specific character, and consequences of National Socialist medical practice.